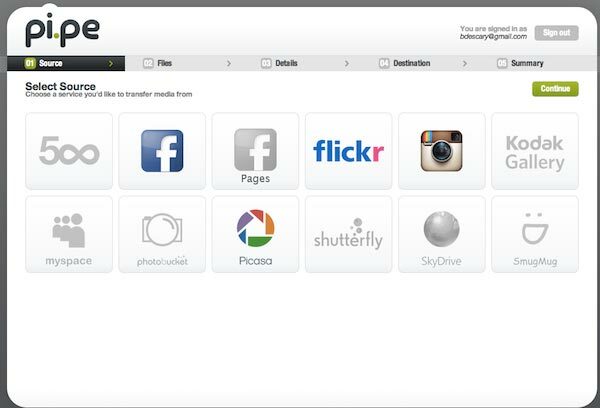 Pi.pe is a new service that allows you to easily transfer your photos between multiple Web services. For example, it can allow you to copy the pictures you have on Facebook to Dropbox, Picasa or Evernote and so on. Pixelpipe is a content migration gateway that allows users to copy media through Pi.pe and have the content distributed across over a dozen social networks, photo/video sites and online storage services. Pi.pe emanates from home Pixelpipe and Web service allows you to distribute the content that you create, on multiple hosting sites. When you send a video on Pixelpipe, the service automatically redistributing it on one or more hosting platforms. Which facilitates the publication and distribution of content above. For its part, Pi.pe copy your photos to a hosting service to another. Useful to create a backup of your photos or just to fill a new service you use. The photos you upload using Pi.pe are not destroyed on the service in which they arise. They are just copied to the new service you have added. Currently Pi.pe supports 15 content hosting services. Pi.pe seems particularly suitable for rapidly moving web photo albums to your computer. The easiest way is to add as Dropbox service that will accommodate your photos. Then you can easily recover pictures that are on Facebook, Instagram or Flickr. For now, this service is in beta.